My old college backpack has more miles on it now than was ever intended. Between short trips through parking lots, to now walking to the Rink on weekends, her wheels are rough, her fabric is tearing, and there's big holes on the sides where Stitch has dragged it along the cement walls. It still has salt stains from Winter and mud splotches from this wet Spring. She won't last much longer. I think it's time that he got his Zuca. I've already initiated conversations with the grandparents, who have never known what to get him. Ideally he should have one when he gets back in the fall. I think that would be a nice, "Welcome home, Get Back to Work," gift. And it's not just Zucas. It's Chloe Noel, the "uniform" of the skating girl. It's Sparkle soakers. It's Zeets for your Zuca. It's the glitter velvet dress. It's Joshua Jewel. (Google it and weep.) It's crystal encrusted gloves, which they lost the mate to so one hand looks like Where's Waldo and the other looks like Princess Aurora. It's the skates themselves, which are expensive to begin with but you can trick out with glitter treatments and the Skate Techs are always trying to upsell some kind of marine waterproofing treatment for them which I totally get but would think that would be part of the general package of buying an expensive pair of skates. It's headbands, crash pads, special tights, special journals, spin trainers, jump ropes, some kind of special bungee cord set that comes with a video, and skate towels because that old washcloth you were using just isn't good enough. I'm shocked there's no special skate polish for boys and I can get away with basic Kiwi. I escape a decent portion of the Skating Gak simply because I have a boy, but commercially produced boy's skatewear is insanely priced. Skating is an expensive sport. But I've come to understand that there are things that are priority, and everything else is detritus. Number one is skates. Number two is coaching. Number three is ice time. Then there's a mysterious Fourth Element which I can't buy at all and that's Discipline. I get to teach that one. I've observed that the amount and cost of Skating Gear on any particular skater exists in reverse proportion to actual skating ability. 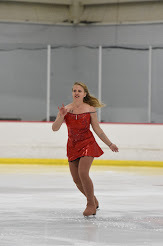 The girl who owns a crystal Zuca, some pretty high test skates, a coordinating Chloe Noel outfit, and LED guards? She's in Beta and she's been there for awhile. The young woman skating in torn tights, warmup capris and a t-shirt, carries her battered skates in an old backpack and I've never seen her with soakers? She's getting ready for Regionals. The little mite in the pretty skating dress is struggling with edges, but the kid who looks like she's just in her play clothes has them down. Now this isn't always true, but it's a pretty good general rule. So, anytime I see some chick with a super-fancy Zuca and super fancy accessories, I never assume she is a halfway decent skater. In fact, the more stuff I see, the more I roll my eyes and wait to watch her skate. My hesitation in buying a Zuca for Stitch is only halfway about money. Yes, I'm balking at price, but I want Stitch to understand that having the accessory doesn't give you the skill. As Dad says, "I could own a BMW, doesn't mean I can drive." Gordon will be getting his pretty soon, and I kind of want to ask Stitch if the Zuca makes Gordon skate any better. Does the Zeet smooth out the back crossover? Do LED Guards make the jump higher? Does the glitter soaker make edges easier? I think it would be cool to be the kid who shows up with an old bag, nothing but skates and a killer mindset. But then, I'm not (nearly) eight anymore. Just be glad he's not joining a USFS synchro team where the 'stuff' is not optional and you can't purchase it gradually. Oh, and guess what piece of equipment they don't use? ? The Zuca ! Every time the mother of some child in Chloes tells me she can't do lessons because they can't afford them I want to scream. Yeah, because you just spent the equivalent of a month's worth on her pants. Don't forget the matching jacket! I think the Chloe Noels are a fading fad, actually, now that Pre-Free girls are getting in on it. I'd place money on a new Hobo Noel chic coming into fashion. Note the new Hot Pants and Tights look coming onto the ice, and that's a look the little girls can't (and shouldn't try to) carry off.